Google (s GOOG) CEO Larry Page delivered some updates on Google+ during Thursday’s conference call, saying that over 170 million Google users have now upgraded to Google+, which presumably means that they have activated their Google+ profile. Page also said that there are two parts to the Google+ experience: The Google+ service, which is available on the web as well as on mobile devices, and the integration of Google+ data into other Google products – something he called the “social spine” of Google. One example he mentioned were app and content recommendations of friends that are shown on Google Play. “You don’t think of that as Google+, it just comes from that infrastructure,” he said. 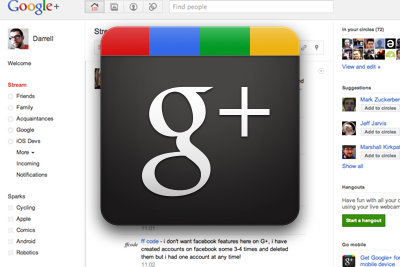 Page added that the company has seen “some impressive growth” for the social networking part of Google+ as well. Google has seen some criticism in the past for sharing numbers about Google+ that left a lot of questions. Most recently, Page said that “well over 100 million users” were active on Google+. But previously, the company had also mixed in numbers of people who were using properties like GMail, which comes with some Google+ integration. Page’s remarks from Thursday, and his efforts to paint Google+ as a coin with two sides, was supposed to address some of the criticism the company received for releasing these kinds of fuzzy numbers. But he passed on the chance to further clarify how many people are using Google+ as a social destination. The “social spine” seems to be the most important function at present, at some point in the future Google+ as a social network will become the norm for new web users. If number of shares on any blog like tweets, in share, f share are any reflection of affinity to a service. I see g+ always way behind as off now. Just take this page Tweet – 77, In share 28.